Parking-structure costs have climbed to $100,000 a stall, but that hasn’t dissuaded Sound Transit from adding a Kent garage that voters were promised in 2008. Sound Transit’s financial odometer will soon roll past $100,000 per stall to provide parking garages for its growing clientele of park-and-ride customers. The agency says cost estimates have soared to $65 million, compared with the previous $35 million, to add as many as 550 spaces by 2023 at the Sounder train station in Kent, which already has one big garage. 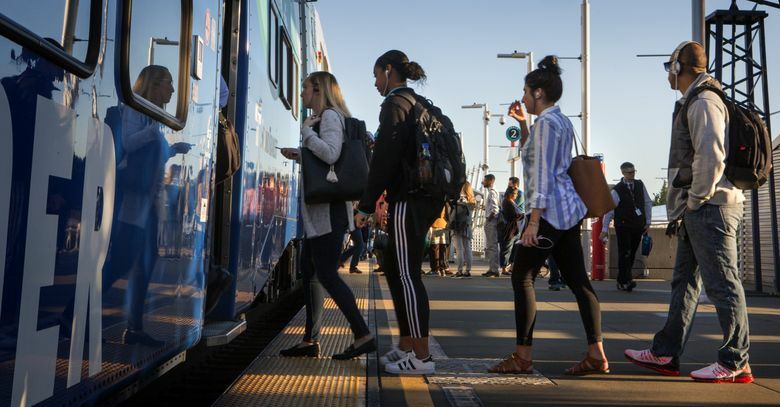 The project will keep a promise made to voters during the Sound Transit 2 campaign in 2008, then deferred during the Great Recession, to boost park-and-ride capacity next to Sounder commuter trains. Four projects that voters approved in 2008 are heading toward construction. Kent Station: A site will be chosen in November for a $65 million garage adding a net 470 to 550 stalls, to open in 2023, with sidewalk and bicycling improvements. Transit staff will display options and answer questions from 4-7 p.m. Thursday, Sept. 21, at the station, 301 Railroad Ave. N.
Auburn Station: Planning is underway for a garage to be added by 2023. Staff will present options and answer questions from 4-7 p.m. Tuesday, Sept. 19, at the station, 23 A St. S.W. Sumner Station: Sound Transit will build a garage, sidewalks and lighting, adding a net 505 stalls by 2021, for $52 million. Puyallup Station: Parking capacity will increase by 503 spaces in 2021, in a $60 million project to include car and bike access within a half-mile. Sound Transit filed a condemnation lawsuit in July to compel Puyallup Eagles to sell their lodge. The new figures average out to $118,000 a space, though the project includes $3 million for improvements unrelated to parking, such as passenger drop-off areas, new bus shelters, walk and bike paths, and illumination. High land prices and a contractor’s market are taking their toll, and the agency aims to surpass the 450 stalls promised in 2008. Transit staff say new Kent figures are based on Sumner and Puyallup parking expansions that will be built sooner. 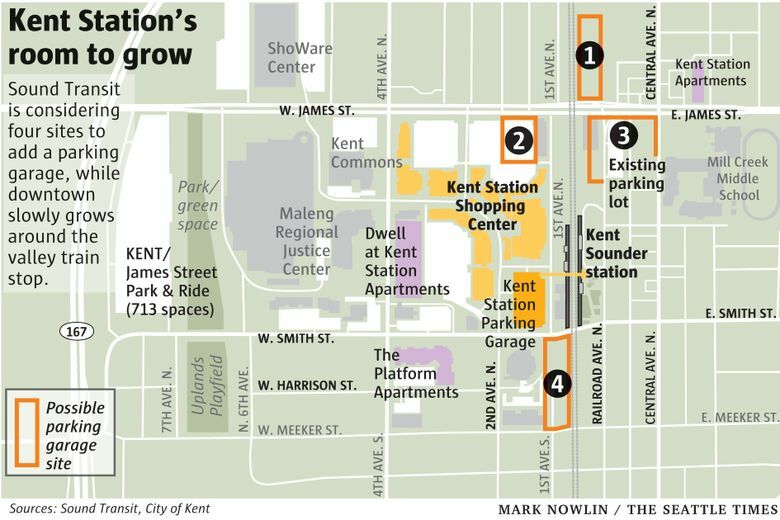 Four sites for the second Kent Station garage are still being studied. Similar issues are expected to drive up the cost for a second garage at Auburn Station, and contributed to a potential $500 million increase to build a Lynnwood light-rail extension. The voter-approved Sound Transit 3 plan, featuring eight light-rail extensions, bus-rapid transit and more Sounder service, calls for 8,560 more parking stalls across three counties. The estimated cost of the Kent garage raises questions about whether last year’s average estimate in ST3 — $69,000 a space in current dollars — will soar and make the capacity harder to deliver. Agency spokesman Geoff Patrick said the projection should hold up, since there will also be economic slowdowns during the long, 25-year ST3 program. Locations matter too, in guessing cost. Using open land in Fife should be cheaper than mixing garages with apartments or retail as envisioned for downtown Everett. Last year’s Angle Lake Station garage, on vacant land and bid during a slower economy, was built for $35,000 per stall. In many regions, the strategy of building station garages triggers second-guessing by pro-transit urbanists. How high of a subsidy to park at a train station is too high? Should users pay, or does that penalize lower-wage workers? Are parking garages that support driving a wise use of land in the face of high housing costs and climate change? The answer in Kent: full speed ahead. Kent’s existing 996 garage and surface stalls fill early, usually around 7 a.m. After that, people park legally and illegally in vast off-site lots, or on side streets. “Hide and ride” parking has occurred near Sounder stations for at least a decade. But the old downtown is also growing around the station, where new restaurants, a movie theater and shops bring activity. Apartments named “Kent Station,” “Dwell at Kent Station” and “The Platform” promote trackside lifestyles. Suburbs should supply more of that density, plus bicycling and walking routes, and affordable housing, environmental thinkers say. “We don’t believe that spending $100,000 per parking space in large structured garages is a very good use of transit funding,” said Tim Gould, transportation and land-use chair at Sierra Club Washington. These new parking garages being built with ST2 and ST3 money should collect fees from users, he said. Gould said that while locations vary, “cities like Kent may find it difficult to both promote a people-oriented downtown and provide lots of parking by the Sounder station.” More traffic going to bigger parking facilities would make walking nearby less desirable and more dangerous, he said. Four more Sounder trips each weekday, two northbound and two southbound, will be added Sept. 25. A faster direct trackway through south Tacoma opens late this year. Sounder’s south-line ridership is projected to grow from 19,000 per weekday last year, to 30,000 boardings in 2025. Beyond that, ST3 will fund longer boarding platforms to match 10-car trains, a 40 percent capacity boost compared with seven-car maximums today. Critics have objected that free parking promotes long drives to reach the stations, along a BNSF Railway route that was built decades ago to move freight. Some 18 percent of Kent Station users live so far out — in exurbs like Covington — that they don’t pay Sound Transit taxes. Another problem is subsidy — to collect $100,000 a space, transit agencies would need to charge $8 per day over a half-century for parking. Meanwhile, commuters vote with their wheels and fare cards. Even on a less-busy Monday, the garage filled by 7:40 a.m., before the last two trains of the morning rush. Ed Collins, of Ravensdale, and his daughter, Kandiss Reed, drove a half-hour to reach Kent Station, arriving 20 minutes early Monday to find a top-deck space. They spent the time checking messages in the car. Collins says that 50 percent of mornings, he drops her off and drives alone into Seattle. Maya Vengadasalam found a space well before 7 a.m. but said more garage capacity would reduce the stress of uncertainty. She confesses that a handful of times, she parked in the shopping center around the corner, at risk of being fined or towed. Sound Transit says 51 percent of riders drive to Kent Station, but the 12 percent “walk” share includes many who park off-site. Actually, downtown Kent already offers an additional 713 spaces at an old park-and-ride site off James Street — but it’s a half-mile away to the west. And it’s two-thirds empty, on average. Slinging her backpack on, Elizabeth Daniel locked her car there and set out in athletic shoes. Daniel said she enjoys the walk, except on cold, wet days. “It’s pretty much the same amount of time coming here and walking as it takes looking for parking” in a crowded garage, she said. Litman notes that despite their cost, parking spaces for Sounder are cheaper and more realistic than creating similar capacity by widening Interstate 5. Sound Transit board member Pete von Reichbauer, a Metropolitan King County Council member from Federal Way, shrugs off objections. “I regard our parking garages as essential linchpins to the success of our rail program. If people cannot get to the stations and park their cars, they will not use our system,” he said. The geography around Kent’s valley station — where four-lane James and Smith streets climb a long hill to reach where most riders live — makes it especially tough to create bicycle trails and rapid-bus corridors to replace driving. “The $65 million would be gone in a snap,” Cooke figures. And in Kent, there’s no appetite to follow Seattle and create bus-only lanes from general traffic lanes.